Let me start out by saying I was interested in this book before I found out it was written, at the time, by a fourteen year old. After I acquired it I discovered this fact and was even more intrigued and eager to read it. I was not disappointed. To have been fourteen when she penned this story, Cayla Kluver's writing shows a remarkable depth, strength, and polish to it. I was kind of amazed really. Not so much by the fact that a fourteen year old could conceive of and then write a good tale. I know people have good imaginations and creativity at any age. What amazed me more was the breadth of research she must have done to paint such a vivid and accurate picture of the time period... because although the book does take place in an imaginary kingdom, the customs, dress, environment, and culture is obviously of the middle ages. And she was phenomenal at setting the stage, conveying that culture, and making it all seem so real. I loved the characters... just about all of them. Although Princess Alera does not like Steldor, strongly dislikes him in fact, I kind of liked him. Even though he is arrogant. But that very thing, which completely annoys him, kind of made me like him because I think there are more depths to him that the reader hasn't discovered yet and probably will discover in the following books. (Yes, this is a trilogy.) Narian I liked, of course, because he is shrouded in mystery. But I think we have a good love triangle about to start here. I LOVE love triangles! At least if they're done well. So I'm looking forward to seeing where Cayla Kluver takes this one. 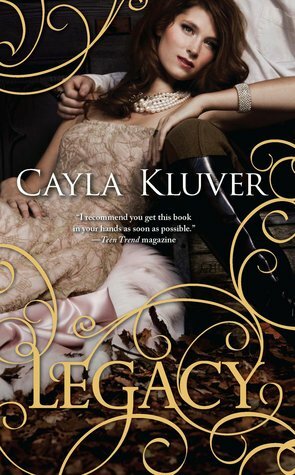 I enjoyed the action, the setup, the flashes of romance, and the richness of the setting and time period. This was a great story and I look forward to seeing more from Cayla in future!